The fourth day in Susan Lucci’s work week-long hosting gig on Hallmark’s Home and Family was an episode of the lifestyle show with an “All My Children” (AMC) theme. It opened with a reimagining of the last AMC opening with the last theme song playing over it. This had yours truly in tears off the bat. Who better to join Lucci as a guide through AMC-themed segments on the lifestyle talk show than eleven of the iconic ABC soap’s most memorable actors: Peter Bergman (Cliff Warner), Kathleen Noone (Ellen Shepherd), Eden Riegel (Bianca Montgomery), Laurence Lau (Greg Nelson), Kim Delaney (Jenny Gardner), Eva LaRue (Maria Santos), John Callahan (Edmund Grey) Jill Larson (Opal Cortlandt), Michael E. Knight (Tad Martin), Cameron Mathison (Ryan Lavery), and Taylor Miller (Nina Warner). Lucci noted that Nixon’s focus in her long, expansive career as a writer in daytime, was always that our families sustain us. She also pointed out that Nixon never wrote “cardboard characters,” always giving them flaws, which allowed audiences to relate to them. “Although all of our families were dysfunctional, we were trying to be functional,” Lucci noted of her and her cast mates’ AMC families. As clips of highlights from Erica’s career as a mother played, including the unforgettable scene in which Bianca came out to her, Lucci cried. She and Eden Riegel, who played Bianca at the time, cried too, and the two embraced. Lucci recalled talking to producer Jean Dadario Burke about the high rate of suicide among gay youth, many of whom fear coming out to their parents and instead take their own lives. Riegel met her husband, Andrew Miller, through costar Cameron Mathison (Ryan Lavery). Mathison recalled how Miller was the only one of his male friends he’d consider introducing his good friend, Riegel, to! Noone noted the unique way Nixon told the story of Ellen’s husband, Mark’s, addiction storyline. “Agnes Nixon wanted to deal with it [addiction]through family…She wanted to talk about the subtleties of the dissolution of family,” Noone said. Peter Bergman underscored Lucci’s initial point about Nixon’s focus on the sustaining force of family. He recalled how when Erica struggled with her own addiction, her on-screen brother, Mark (Mark La Mura) returned to offer her support. Greg (Laurence Lau) and Jenny (Kim Delaney) spoke of being overwhelmed by the response from fans, which Lucci said truly defines a soap supercouple, to their pairing on the show. Lau expressed shock and fear at the mob that showed up and rushed the two actors at a fan event in Tampa once. Scroll down to see Delaney’s back stage video of the AMC actor love fest! A special kind of soap magic occurs when a supercouple gets together in real life. Precisely that happened with Eva LaRue (Maria Santos) and John Callahan (Edmund Grey). They were married for nine years and have a daughter, Kaya. See LaRue’s Instagram posts about the talk show appearance below. Larson rarely had a scene on AMC in which she wasn’t decked out in chunky jewelry, doling out wise advice to her loved ones. Larson fondly recalled working with Lucci for 22 years. Her on-screen son, Knight, was warm and congenial as he walked viewers through a recipe for a “No-Fry Fried Ice Cream” based on a snack Tad loved. So sang Barbra Streisand over images of late AMC actors in an in memoriam segment that closed the show. The montage brought many of the cast members and even co-host Debbie Matenopolous to tears. What Are We Going to Do About It, Fellow-AMC Fans? 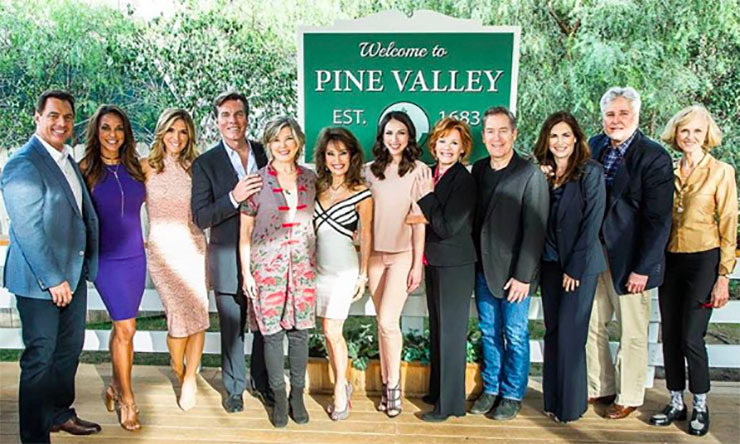 Now, AMC fans, we know hearing about this fabulous Pine Valley reunion has inspired you. So read more about what you can do to see that AMC and “One Life to Live” come back to our screens. Then do it! Next Article General Hospital February Sweeps: Just In Time for Julexis?